Thursday, April 25, 1912: I am beginning to worry about final exams. I’m afraid that I may get left in some of my studies. But I hope that it won’t happen that way. It sounds like Grandma was at the procrastination stage—she knew that she needed to study, but hadn’t gotten beyond worrying. When I procrastinate, I think of other things that MUST be done—like cooking. Here’s an old Rhubarb Pudding recipe that I found in the April 1912 issue of Good Housekeeping magazine. Sift together two cupfuls of flour, a pinch of salt, spices as desired, two teaspoonfuls of baking powder and half a cupful of sugar. Stir in one egg beaten with half a cupful of milk and two tablespoonfuls of butter; add two cupfuls of rhubarb, cut into small pieces (use the pink part with the skin left on), bake twenty minutes and serve with a sauce. The Rhubarb Pudding was quite good. It was a pleasant mixture of sweet and tart tastes, and had the texture of shortcake. I served the Rhubarb Pudding with Vanilla Sauce. Mix sugar, cornstarch, and salt in sauce pan. Add boiling water; and boil until thick and clear. Continue simmering over low heat, while stirring for 20 minutes. Stir in the butter, vanilla, and nutmeg. Can be refrigerated and reheated. Posted on April 25, 2012 August 30, 2015 by SherylPosted in Food, recipesTagged dessert, rhubarb. My mom used to grow rhubarb in her garden and she was very fond of her rhubarb pie. My father, sister and I never learned to like it though. Poor Mom! It’s funny how things that aren’t much fun to do can seem okay if I am trying to avoid doing something else that I consider even worse. When I was a little girl my Grandmother grew her own rhubarb and strawberries and made strawberry rhubarb pie. I always had a hard time getting past the tartness…but I think I just might have to give it another try now that I have more ‘grown up’ tastes! Your Vanilla Sauce probably makes a nice sweet/tart balance. Looks great! I find that I like lots of foods now that I really disliked when I was a child. Maybe my taste buds have changed. My rhubarb is ready to pick so I will try this tonight. Thanks. When I was a child growing up in Pennsylvania, we always put milk on strawberry shortcake. (I know that most people today think that is really an unusual way to eat shortcake, but it was good.) 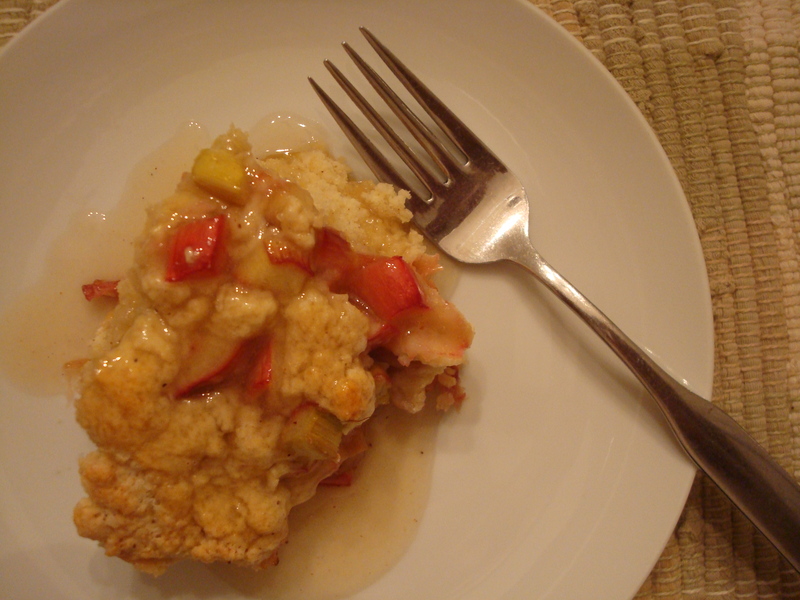 In any case since the the Rhubarb Pudding seemed like a type of shortcake, I put some in a bowl and poured milk over it–and I thought it was really good. In Wisconsin, we even put milk on rhubarb sauce! Dairy state! As a dairy farmer’s daughter, it sounds good to me–I’ll have to give try milk on rhubarb sauce. I’m thinking about Helena’s comment: “I’m afraid that I may get left in some of my studies.” Since the school looks so tiny, I wonder if she’d have to sit there and hear the next grade of lessons that she is missing if she were held back. That would be frustrating. My stepmother made rhubarb pie and it was apparently real good it but I never tried it. I never got over the fact that rhubarb is stalks and called rhubarb. There was only one teacher in the high school, so I think that all of the students were in one room. It was a 3-year high school. I assume that the teacher would teach a lesson to the students in one grade while the students in the other grades did independent work. It would be frustrating to be held back in a school where you are with the same group of students–though your comment brings back memories of something my mother once said. She taught for awhile in a one-room elementary school. She said that she like the way that strong students would listen in on the lesson being taught to the grade ahead–and struggling learners would surreptitiously listen in on the lesson being taught to the grade behind and learn the things they’d missed. My relatives poured milk on cake too. Some still do, and it doesn’t matter what kind of cake. Grandma has referred to herself as bashful. I wonder if she is introverted, and that can make it challenging to learn new material in the classroom setting. She just needs more time. Procrastinators motto: There’s no time like not right now. My grandmother used to make rhubarb sauce, like apple sauce I liked it ok. I grew rhubarb for a few years but somehow I never used it much so finally just let it go. I have one rhubarb plant in my yard–but it seems like it isn’t very prolific and I can barely get enough rhubarb at one time time make a pie or rhubarb sauce or whatever–so I often end up buying a few stalks at the supermarket to supplement what I grow.